Re-Imaging Futures: Legacy brings together the photographers of Depth of Field to discuss the development of the collective alongside the history of photography in Nigeria. 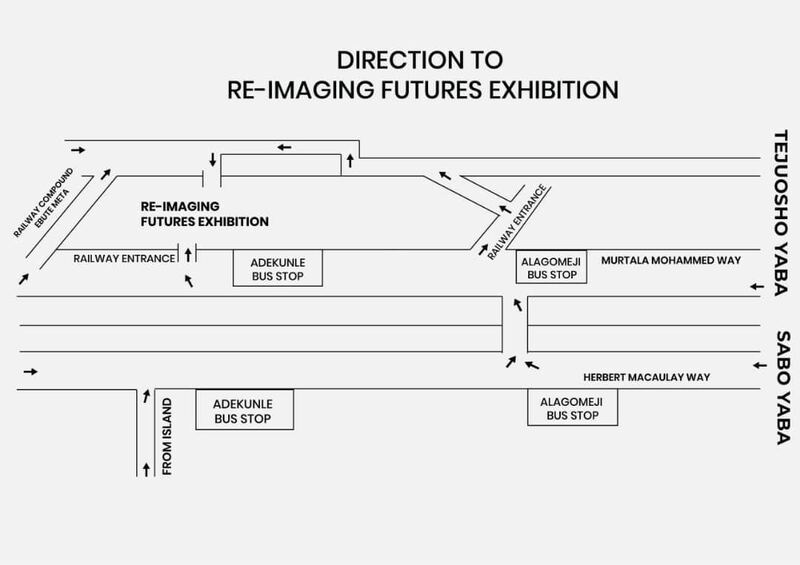 Re-Imaging Futures: Future Images features a curated guest panel discussing contemporary issues through the window of art in Nigeria today. Their conversations will be around what Nigerianness means especially as people working in the art world today. One version of Nigeria's history begins on Mount Patti in a supposed letter from Flora Shaw to Lord Lugard a few years after the Berlin Conference in 1885. She opens the letter with romantic descriptions of the ambience in her newfound abode. In the mornings the sun is a 'young bronze' and in the evening it is 'dashing, aged,' a painting come alive. Then she moves on to what she considers to be an important matter: Bundu—a 14 year old boy from the eastern tribe, her household and tour guide, described by two Englishmen as 'clean imperial material'—had almost been beheaded at a festival celebrating her visit. She steps in—as is expected of a white person—and saves the day. Later, at night, she is unable to escape her writer's block and cannot finish the last paragraph of a novel she is writing. She turns instead, amidst 'flowers waltzing with the gently whirring winds,' and air that was 'blue, easy to soak in' to write an article for THE TIMES. As she writes she hears drumbeats from another village. The drums make her nostalgic. She has heard the same sound in hundreds of villages across the country. She thinks to herself: 'For a people so strong, so diverse, so nourished by culture and nature, I think together they will make a formidable brand.' In the article she highlights the magic and poetry of the land. She states the gains of amalgamating the country, its benefits to both the tribes and the Queen. She thinks the name 'Royal Niger Company Territories' is too long, and 'Central Sudan'—the name by which merchants and diplomats refer to the region—does not represent the people. She proposes instead a name she believes to be both convenient and romantic. Nigeria. Another short, less romantic but more practical version of history: The Royal Niger Company sold its territories to the British Government for 865,000 pounds and thus Nigeria became a British Protectorate. From the beginning, the country was a colonial enterprise. There was no romance, goodwill or hard feelings involved. It was, as they say, simply business. Around 1960 when Nigeria gained independence, Soyinka was commissioned to write a play in celebration. He wrote A Dance of the Forests, speaking about the need to forge a new identity free from western imperialism and its imposed cartographies. The work angered the elite of course, and they withdrew support. After, with the aid of a Rockefeller grant, Soyinka embarked on a trans-national road trip across the country in a Land Rover, armed with a tape-recorder and a camera, doing research. The book he was supposed to write at the end of the road trip never surfaced. But what did Soyinka find on his road trip? 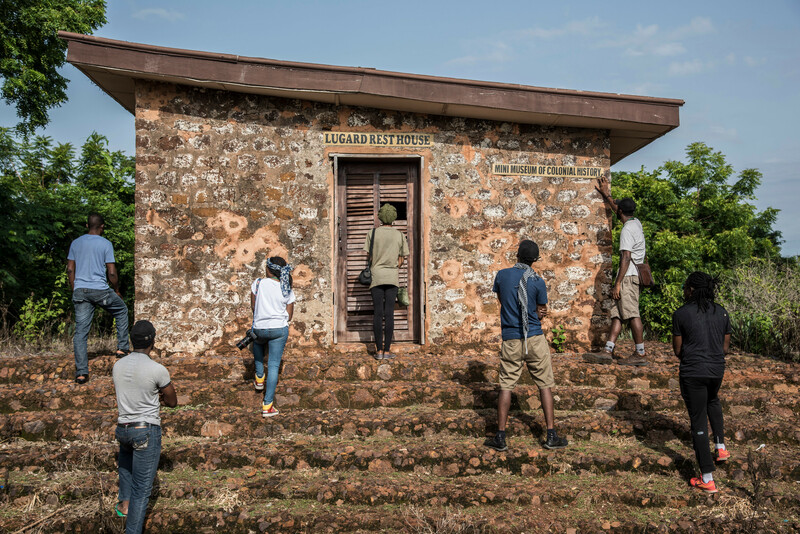 One hundred years after the northern and southern protectorates were amalgamated into a single British colony and 50 years after Soyinka's road trip, twelve Nigerian writers, photographers, and filmmakers traveled by road across the country for a total of 81 days. Organized by Invisible Borders Trans-African Photographers Organization, the project, called Borders Within sought to engage and, perhaps, expand the confines of the imposed cartography that is Nigeria by interrogating what it means to be Nigerian. Working in two batches between 2016 and 2017, the project followed the tradition of previous artistic road trip interventions established by Invisible Borders. The artists traveled in the same vehicle, living, working and interacting with each other. The routes were fluid, but encompassing, always beginning from and ending at Lagos. What was pertinent to the artists was not to provide answers but to ask questions, questions that could help in decoding both the contemporary and the historical. The first group traveled counter-clockwise around the country to retrace history and how it has molded the country's present. The second group traveled clockwise, in an effort to understand contemporary Nigeria, and what it means to be Nigerian today. Nigerianness is of course an inexhaustible phenomenon. What this project aimed for was not an encompassing definition but instead an enumeration of several ways of entering the conversation by illuminating discoveries that tilt the edifice of ignorance on several sides of the country. For example, a discovery by the artists of how 86 different languages exist in Adamawa alone made them see the state—and indeed Nigeria as a whole—in a new light. Even to encounter the fact that there is a larger portion of Adamawa kingdom in Cameroon than inside Nigeria further exposed to the artists the effect of the imposed cartography they were grappling with. And other examples abound. The methodology employed by both groups was simple: their bodies became a medium through which their lives could be interspersed with those of the people they encountered on the road—a central, physical and metaphorical figure around which the project revolved. They engaged narratives of the common and outlier. It had nothing to do with a didactic way of seeing, instead it was about being open to possibilities and nuances that the road presented. The aim was to—if possible—bridge the gap between preconceived notions and what is real by acquiring fresh perceptions. The task was to, by engaging with and seeing through the eyes of others, grapple with serious questions that had been plaguing the country for about 100 years. These questions revolved around the self as a doorway to examining the concept of Nigeria as a country. For example, who am I in relation to the artificial map? How am I product of what I have been inevitably named? How do I interact across the several visible and invisible borders I confront as a Nigerian? Together as a group there were audio-visual documentations, visits to historical sites, and several site-specific interventions. Also, every artist on the road had a personal project alongside the group's overarching endeavor. The project themes, ranging from masculinity, family, history, memory, movement, to the Civil War, enumerate pathways through which one can enter into the immense topic of Nigerianness. Today, some of the content of Flora Shaw's letter remain true: Nigeria is beautiful, the people are strong, tenacious and diverse. Yet, what is questionable in her letter is whether an amalgamation of these tribes has created a 'formidable brand.' In a country presently grappling with violence, political instability, ethnic crises, and a lingering shadow of a colonial past, showing the work resulting from this project now is timely in response to the question of Nigeria as a formidable brand. Regardless of the answer, the chicken of this colonial enterprise has come home to roost. 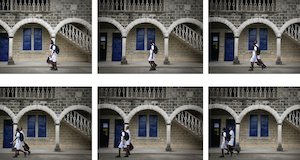 Re-Imaging Futures: A Trans-Nigerian Conversation is an exhibition as well as an intervention. The site of the exhibition itself—the Nigerian Railway Corporation Yard in Yaba, Lagos—is a location that embodies a lot of the themes considered during the process of the road trips. The abandoned criss-crosses of trains and colonial structures, doubled with the historical function of railways in Nigeria are reminiscent of colonial presence and the perceived glory of a distant past. Furthermore, the railway does not only evoke movement (a premise on which the road trip is predicated), it also played a major role in the formation and subsequent colonization of the country. 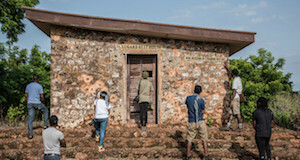 Thus, to exhibit this project which looks at the reengagement and re-imagination of Nigerian history at this location is to project this new narrative onto this now redundant, abandoned colonial structure, with hopes of setting up a frame for conversation around the tensions between the past and present.